AFT1493 | Nov. 2016 Advocate: Faculty comes out in force to demand a fair contract! Nov. 2016 Advocate: Faculty comes out in force to demand a fair contract! Faculty comes out in force to demand a fair contract! Last May, 60 faculty members jammed a Board of Trustees meeting to stand behind their colleagues who made presentations on the need for Workload Equity. As of this October, the union had gathered, and submitted to the Board of Trustees, nearly 500 faculty signatures on a petition demanding that the District negotiate improvements in the language specifying faculty workload in Appendix D of the Contract. 500 signatures = 1/2 of faculty working in the District, and 75% of all full-time faculty signed. What did the District do? They refused to negotiate any Workload Equity language – period. They said they needed more data, more evidence, to demonstrate that the burden of non-teaching duties has grown exponentially for full-time faculty. What now? The negotiations process is moving into Fact Finding after the District declared Impasse and a mediator wasn’t able to bring our two sides together. There’s a reason for that: because the District’s proposals are all “Take Backs”, decreasing raises by calling for changes in the way faculty compensation had previously been calculated, limiting our ability to make our own flex day choices and changing faculty evaluation procedures. And Workload Equity? Off the table. What did the union do? We invited faculty to come to open forums on October 18, 19 & 20 on all three campuses to learn more about the contract dispute and talk about what we can do – not what the union leaders can do, but what faculty acting together, united, can do. Below are reports from each of the campus meetings. 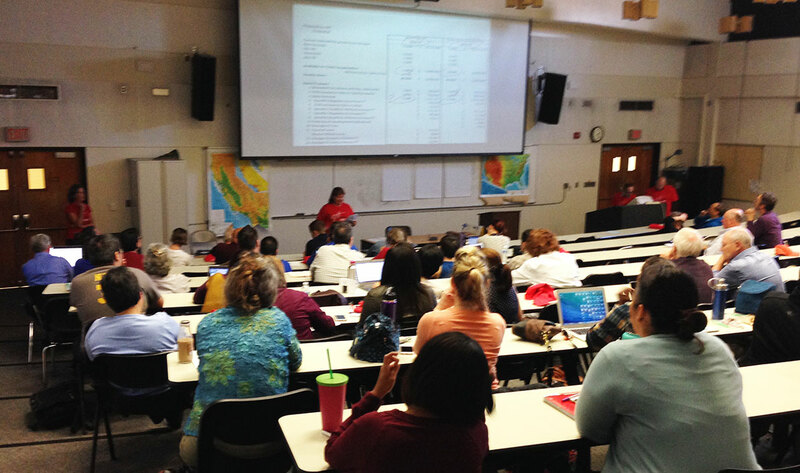 On Tuesday, October 18th, AFT held the first of the three campus forums at CSM in College Vista. The meeting quickly ran out of chairs and faculty leaned on walls and sat anywhere that they could (see photo). Monica Malamud and Joaquin Rivera, from the AFT negotiation team, first took the opportunity to point out to faculty that only the union is the is the exclusive bargaining representative for faculty and can provide complete and factual information. On that note, faculty were eager to hear the updates on the District’s proposed take-backs. The first proposal reduces our share of the formula by pushing costs usually absorbed by the District onto faculty into a package they call “total compensation,” out of which any remaining money would then be available for a much smaller raise than the previous contract. The second proposal requires approval of flexible Flex activities and would pay part-timers who participate in Flex activities a lower rate than previously. The third proposal would do away with the three-year process that included the AFT, Senate and administration in the creation of a new evaluation procedure. Also discussed was the failure to seriously address the union’s Workload Equity proposal that would attempt to quantify the duties performed by faculty, and create a system to attempt a more equitable work/life balance. Those present then had a lively discussion on the particulars of these proposals and what the response should be from faculty, given that these proposals were very unsatisfying and do not honor the work that faculty contribute to the District. They were here to find out about the District’s proposed take-backs, as detailed in the September issue of the Advocate. AFT Co-Vice President Katharine Harer welcomed faculty into the meeting, handing out AFT T-shirts and Count-Me-In Cards. Facilitating the meeting was Skyline Chapter Co-Chair Paul Rueckhaus, joined by his Co-Chair, Rob Williams, and Advocate Editor, Eric Brenner, and EC Co-Rep., Nina Floro. Vice President and Chief Negotiator, Joaquin Rivera, and AFT President and Negotiating Team Member, Monica Malamud, discussed the proposed take-backs: Raises reduced from 4.77% to 2%, Increase in the volume and frequency of evaluations, the elimination of flexible flex, and workload equity. As Malamud and Rivera laid out the latest round of contract negotiations, including the news about Fact Finding, frustration and agitation was evident in the amount of hands raised with questions and comments. The bottom line is that our Union and the District did not reach an agreement during the last mediation session. After the negotiation report Katharine Harer and Paul Rueckhaus asked the audience for input on what faculty can do to support the AFT to win a fair contract. These suggestions, which were written on posters, included: attending a Board of Trustees meeting, wearing our red AFT 1493 shirts in solidarity, pushing for more flex opportunities that relate to our particular field of interest, letter-writing, making our students aware/getting our students involved, and, if necessary, Work to Rule. By the end of the meeting, the feeling of agitation in the room had morphed into one of solidarity and determination. 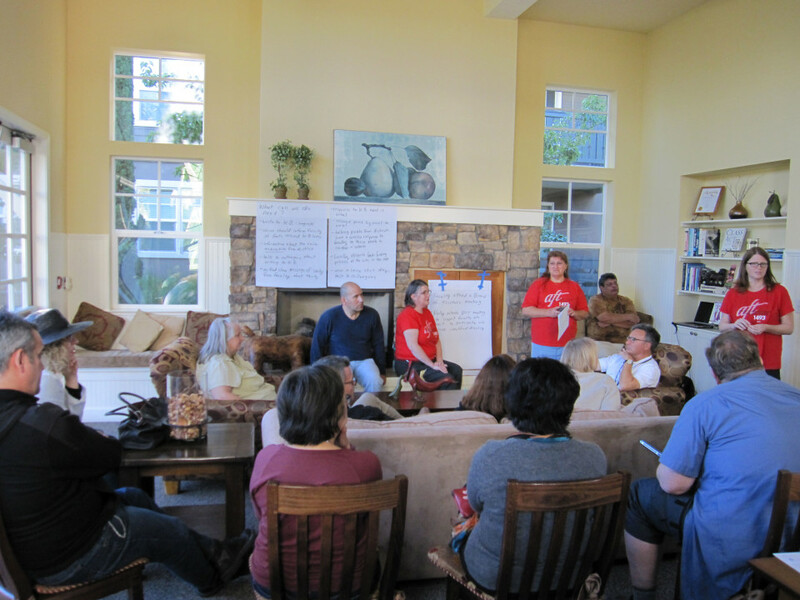 Over thirty faculty members met at Cañada Vista on October 20th to discuss the state of current negotiations along with potential solidarity actions to show support for our negotiating team and reinforce their positions and responses to the latest District proposals (see photo). Faculty overwhelmingly maintained their support for fair salary increases during this unprecedented period of rising property values, which make staying in the area exceedingly difficult. Monica Malamud explained misleading points made by Kathy Blackwood in a recent all faculty email, emphasizing that when looking at higher steps on the salary scale and at part-time salaries, the District does not rank at the top of the Bay Ten. Monica also explained how the District’s proposed changes to “flexible flex” benefits would actually eliminate flexibility by requiring faculty to seek their Dean’s approval to attend outside professional development opportunities many months in advance. Faculty voiced strong support for maintaining “flexible flex” as it stands. 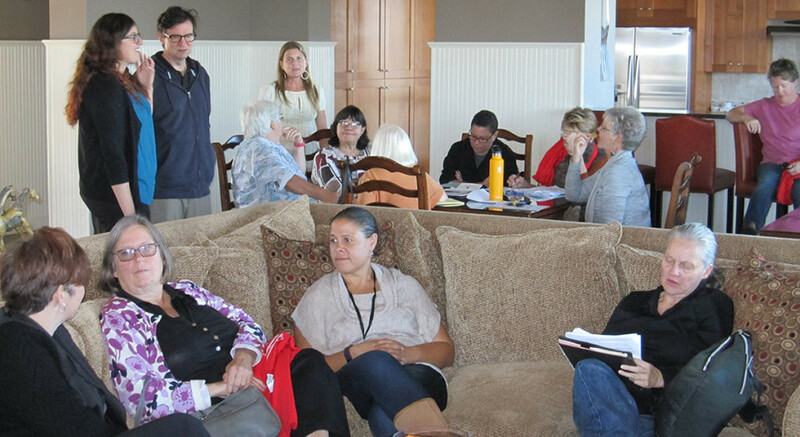 Faculty also voiced support for the current, recently adopted peer evaluation procedures. Faculty had an opportunity to ask questions about their contract. Many requested information about the outcome of previous negotiations and Fact Finding efforts. The overriding question, “How bad is it?”, became a call to action as it was revealed that District-Union relations are in fact quite strained. Conclusion: Around 120 faculty members participated in the open forums at the three colleges. They listened to members of the AFT Negotiating Team, asked questions and made comments. Numerous faculty reacted to the presentations with the conclusion: “The District’s proposals are all take-backs!” At each forum, the group discussed specific actions they would be willing to take to help the union to win a fair contract. Faculty agreed that they need to act in order to show our District how strongly they feel about the issues under dispute. Many even suggested a Work to Rule action, which is unprecendented in our District.